Plano sportsmans totes are a great way to store all our gear. What are Plano sportsman’s totes? The totes are glorified, manly storage containers that mostly function as designed and allow us to store all our gear in a solid, neat, fashion. Basspro shops had them on sale so I picked up four more this year. The 56 Quart is on sale for $10. 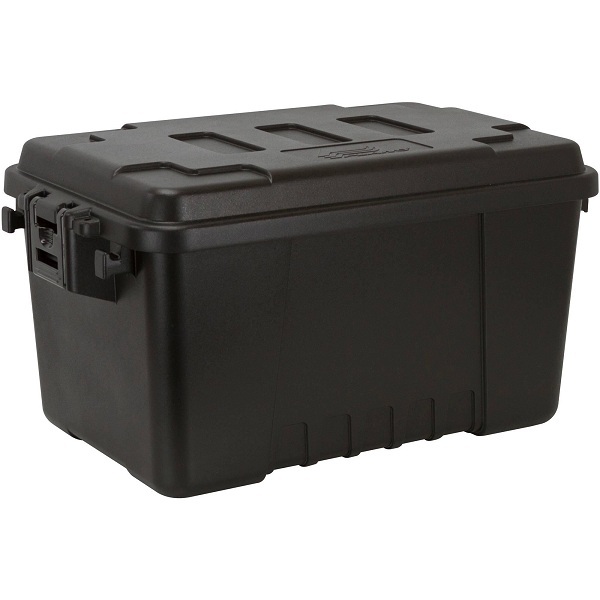 The 68 Quart is on sale for $15, and the Plano XXL sportsman’s trunk is on sale for $20. I’m a big fan of the 56 and the 68 quart, not really a fan of the XXL sportsman’s trunk. There are endless uses for these totes, but I use them specifically for my outdoor and camping gear. The totes are made of Polypropylene (fancy name for plastic). The 56 and the 68 quart are solid and very sturdy. The XXL trunk flexes allot more and I would not think of using it for any kind of serious travel or expensive gear. I use my trunk to hold all the camping gear essentials like paper goods, utensils, cooking gear, etc. The Trunk has wheels that are pretty much useless unless on your on a smooth surface. The dimensions for the 56 quart are 24″L x 12″W x 13″D and the dimensions for the 68 quart are 30″L x 14.25″W x 12.75″D. The totes themselves have weather resistant molding but are not waterproof. You could probably use some foam to make them more resistant if you wanted, but I do not think it is needed. I also like the fact that they have tie down points for anchoring, molded caps for stacking one on top of each other, and they are lockable for that extra layer of security. That being said, they can easily be broken into if someone really wants to get to the contents inside. I’m a big fan of the 56 and the 68 quart totes, especially for the price tag of $10 and $15 each respectively when on sale. I have one XXL Trunk and it’s OK, but I will not be buying anymore of those. I like the sturdier, smaller ones for sure. I throw all my hunting gear in a couple, and all my salt water gear like my waders and boots in others. I throw them in the back of my truck and I am not worried about my stuff bouncing around back there. When all is said and done I stack them em up nice and neat in the corner of my garage and I know where all my gear is. Give me some feed back on your experiences with these totes if you have any.